Tanzanite is a gorgeous gem but, this violet-blue gemstone has much more than mere beauty. When you wear a 925 silver or gold tanzanite ring, you own a gem that is about 1,000 times rarer than diamond. Few experts dispute this claim, the extreme rarity of tanzanite and the significantly limited area in which it is found make it an exotic and exclusive gemstone. It is quite amazing to know that, your tanzanite ring or any tanzanite ring in the world, has its gem sourced within a small patch of land on our planet. Mount Kilimanjaro in Tanzania is a big attraction for visitors to the country. A stretch of land extending to just a few kilometers located at the foothills of Mount Kilimanjaro, is the only place where gem quality tanzanite is found. 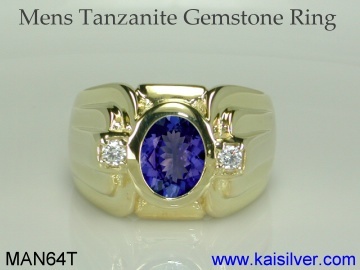 In this report we will introduce you to some gorgeous custom tanzanite rings from Kaisilver. The fact that we say that these are made to order rings implies that, you can pick a design and request for modifications. You can also have us work on a design image or sketch provided by you. Tanzanite is an amazing violet-purple gemstone. Medium tanzanite color offers the best sparkle. The gem is mined in just one location on earth. Tanzanite is about 1,000 times rarer than diamonds. Tanzanite is mined at the foothills of Mt. Kilimanjaro in Tanzania. The birthstone charts list Tanzanite as the birthstone for December. All tanzanite rings are custom made with your design or ours. Both gold and 925 silver tanzanite rings have the same quality. 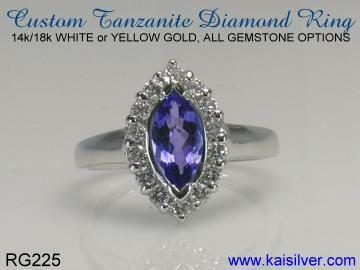 All tanzanite gems are natural, certification is available on request. Tanzanite gold rings can be ordered in 14k or 18k gold. We recommend that tanzanite silver rings be left unplated. All rings are crafted with optimum metal weight. Buying From Kaisilver: Rated as the world's leading online high end custom made jewelry provider, we are honored to service more than 7,000 clients across the globe. We do not support or encourage instant online buying and believe that, you should get the benefit of our expert opinion and advice before choosing to spend your money with us. Email us your requirements at sales@kaisilver.com and let us provide suggestions and options, you could even send us images of your own designs to be custom made. We accept payments through Paypal, Direct Bank Transfer and Western Union. First time buyers would be most comfortable with Paypal. Let us know which mode of payment you prefer and we will email details for the same. There is a production time of 4 to 6 weeks from the date that we receive order confirmation and payment. A stunning tanzanite gemstone ring, the 8x4mm center marquise gem has a row of 1.5mm diamonds surrounding it. By providing a metal weight of 12 to 15 grams for this ring, we deliver a jewel that is long lasting and also more comfortable to wear. You can order a 14k or 18k marquise tanzanite and diamond ring, all three gold colors are priced the same. Equal quality standards are maintained for the gold and silver rings ... more. Tanzanite has a universal appeal, both men and ladies love this lively gemstone. The MAN64T tanzanite ring for men, has a 9x7mm oval tanzanite gem in the center, a 2.5mm round diamond is studded on either side of the tanzanite gemstone. When it comes to men's tanzanite gemstone rings, there is a strong preference for sterling silver. We offer this handsome ring in gold or silver, all ring size requests can be accommodated ... more. Buying From Kaisilver: Rated as the world's leading online high end custom made jewelry provider, we are honored to service more than 7,000 clients across the globe. We do not support or encourage instant online buying and believe that, you should get the benefit of our expert opinion and advice before choosing to spend your money with us. Email us your requirements at sales@kaisilver.com and let us provide suggestions and options, you could even send us images of your own designs to be custom made. The four century old claddagh ring is widely accepted to be the world's most meaningful jewel. Kaisilver crafts fine cladagh rings in gold or 925 silver with the gemstone of your choice. 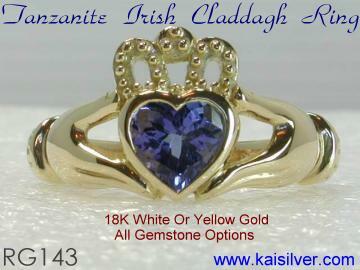 Shown here is a claddagh gold ring with a handpicked and custom cut heart shaped tanzanite gemstone. The meaning and significance of the tanzanite claddagh ring makes it suitable for all occasions. Your jewelry collection can never be complete without a few claddagh rings ... more. An impressive concept for a men's luxury ring, we can personalize the design to suit your style, the center 6mm cushion tanzanite gem can be a larger 6-7mm gem. The 2.5mm glittering diamonds on the side can be replaced with any other gemstone or even, be left out of the design. A sturdy men's ring with a hefty weight of 20-25 grams. crafted to perfection in gold or 925 silver. 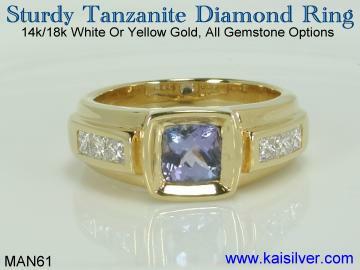 If you are looking for a gold or silver tanzanite ring for men that is easy to maintain go for this ... more.